Ayushman Bharat will reach millions of Indians who were unable to exercise their basic right to inclusive medical care. 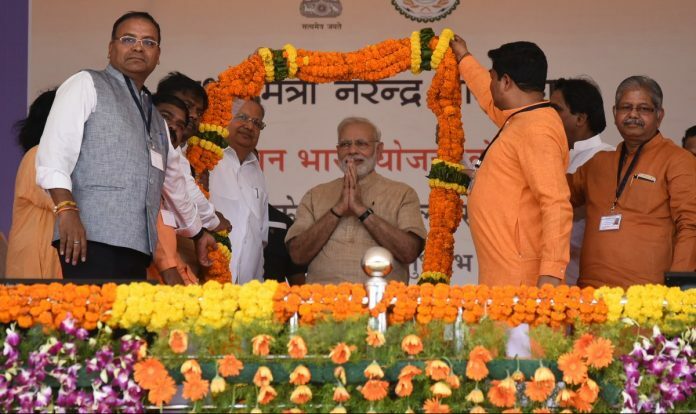 The central government’s landmark welfare scheme, Ayushman Bharat—Pradhan Mantri Jan Aushadhi Yojana (PM-JAY)—has put India on track to realise one of its most formidable challenges: inclusive public healthcare. A staggering 62.58 per cent Indian citizens would pay for their hospitalisation expenses that were earlier not covered through any health protection scheme, BJP leader Arun Jaitley said recently. This is the vital gap that Ayushman Bharat, launched by Prime Minister Narendra Modi on 23 September 2018, plugs. Under the mission, billed as the world’s largest public health scheme, the Centre and states will share expenses in the ratio 60:40. Ayushman Bharat seeks to help India progressively achieve not only Universal Health Care (UHC) but also Sustainable Development Goals (SDG) by providing an insurance cover of Rs 5 lakh for each of the 10.74 crore families listed as poor and vulnerable in the Socio-Economic Census (SEC) Data, 2011. An expected 50 crore individuals would benefit from this scheme, which includes a total of 1,350 medical packages that cover surgery, medical and daycare treatment—including medicines, diagnostics and even transport. Recently, many beneficiary families received a personal letter from the Prime Minister informing them about their eligibility. Since Ayushman Bharat’s launch, 6.85 lakh people have been treated according to government data, Rs 800 crore spent on secondary and tertiary care. A record Rs 297 crore has been spent on cardiology, cardiothoracic and vascular procedures and more than 16, 000 hospitals have been empanelled, of which 8,807 are private hospitals. What is more, according to Ayushman Bharat CEO Dr Indu Bhushan, a record 40.38 lakh PM-JAY cards have been generated. Nearly 3,500 Community Service Centres (CSCs) have been activated to collect data and authenticate beneficiary information, given the scope for fraud. There is no cap on family size and the transactions are cashless. Advanced and expensive procedures such as surgeries for cancer, cardiac issues, brain, spine and dental problems, radiation therapy, chemotherapy, stenting, and specialised tests such as MRI and CT scans come under the ambit of this wide-ranging scheme. The scheme is implemented through the recently instituted National Health Agency (NHA). The experiences of beneficiaries like Laxmi Devi, Sadhanjoy Reang and Anand—who hail from India’s remote villages and towns and are far removed from an efficient healthcare ecosystem—exemplify the reach of the flagship health scheme. Laxmi Devi, the 51-year-old resident of Ram Shehar Gram Panchayat in Himachal Pradesh, would vomit each time she had her meals. Her recurring problem became acute during the monsoon of 2018. As their village had no proper medical facilities, her husband Kishan Lal took her to hospitals nearly 60 km away, in Nalagarh. The doctors there kept Laxmi Devi under observation and conducted several tests, but could not detect the reason for her illness. Finally, they gave up and advised her family to go to Shimla’s Indira Gandhi Medical College. After a week of tests, to their utter shock, Laxmi Devi was diagnosed with oesophageal cancer. The costs involved in the treatment were prohibitive for Kishan Lal, who has a family of five children, in addition to an elderly mother and siblings to support. Being a daily wage labourer, Kishan makes Rs 300-500 a day—which is scarcely sufficient to meet the big large family’s needs. They returned home dejected and Laxmi Devi’s treatment was delayed by a few months. Sometime after September, when the PM-JAY was launched, he got a call from Shimla hospital informing him about the scheme. He submitted his ration and Aadhaar card, got their details verified at the Lok Mitra Kendras set up in his village to authenticate beneficiaries. In three days, the family procured the PM-JAY card, which facilitated the free-of-cost treatment provided to Laxmi Devi. Over the next couple of weeks, several expensive medical procedures from X-ray to ultrasound to CT scans were performed on Laxmi Devi, in Shimla. Doctors prescribed suitable medication, including medicines that range from Rs 20,000 to Rs 35,000, and post-treatment, assured that she was out of danger for now. Laxmi Devi still needs to make repeated trips to the hospital every month for review and check-up. Kishan Lal told this writer he merely has to show his PM-JAY card to get bus tickets booked for Laxmi and himself, as the scheme also covers transportation to hospitals in cities from far-flung areas. “If not for this scheme, my wife would have succumbed to the disease as there was no way I could afford this expensive treatment with the kind of earning I make,” he said. Sadhanjoy Reang of remote Kanchanpur Dasda in North Tripura earns a living as a small farmer. He too barely manages to support his family, including his two children Krishiram and Sunali. They would help their father in the fields, but every evening, 20-year-old Sunali would complain of a terrible headache. While the family dismissed this as strain from working in the fields, the ailment later turned out to be the aggressive and malignant sino-nasal rhabdomyosarcoma—a kind of tumour that is tough to treat surgically and generally has poor prognosis. In December 2018, after Sunali was admitted to the Regional Cancer Hospital in Agartala, her treatment was covered by the PM-JAY card. “We got to know about the PM-JAY scheme through the local Arogya Mitra centre and immediately got the card made,” her brother Krishi Ram said. These centres are part of the Information, Education and Communication (IEC) strategy of the government under which booklets have been made available to all State Health Agencies. While young Sunali’s life still hangs precariously in the balance, PM-JAY saved her family the burden of paying for the expensive the treatment as the insurance covers takes care of it entirely. The case of one-year-old Anand, who hails from a small town in Jharkhand’s Chatra District, is poignant: He was detected with a hole in the heart when he was barely a month old. His father Guniram is the family’s sole breadwinner of the family, and works as a small-time farmer. After learning about his condition, Anand’s parents took him to several hospitals in Jharkhand but sadly there was little improvement in the child’s health. Doctors referred them to the All-India Institute of Medical Sciences (AIIMS), Delhi. With limited resources, the family went to AIIMS where there were asked to deposit Rs. 57,000 for the treatment. Upon taking loans from friends and family members, they booked a date for a surgery that would take place after four months. Fortunately for Anand’s parents, the Ayushman Bharat scheme had been launched by the time they visited AIIMS again. The doctors advised the family to visit the kiosk at the hospital to check their eligibility and get their cards made. The ‘Ayushman Mitra’, a representative at the kiosk, verified their documents and got the family a refund of their earlier deposit and free treatment for all future check-ups and reviews. “Even after discharge, the Ayushman Mitra has been in touch with us and ensured all the medications reach us for the next month or so,” said Guniram. While India’s health sector is among the largest and fastest growing sectors, expected to reach US$ 280 billion, it is bogged by high out-of-pocket expenditure and low insurance coverage for both rural and urban Indians. Within 100 days of its launch, the scheme has won international attention and acclaim, with even philanthropist and Microsoft co-founder Bill Gates commending its expansive reach. As the scheme picks up, it is hoped more hospitals would come up, especially in Tier-2 and Tier-3 cities and towns, where they are also assured of patients. However, providing high-end, state-of-the-art infrastructure would be an uphill task for these new hospitals or existing government ones. In case a state government declines to participate in Ayushman Bharat, as Chhattisgarh has recently done, patients from poor families would not be left out of the scheme as the central government announced it would foot the entire bill. This has brought hope and relief to rightful beneficiaries were caught in this political crossfire. Another monumental challenge for the scheme is the reluctance of big corporate hospitals to come on board, mainly because of financial reasons. Given the rates of the scheme are lower than that of the Central Government Health Scheme and insurance models do not allow two separate rates for the same procedure, many private hospitals with excellent infrastructure are yet to empanel themselves. However, since these are still early days for the mega scheme, one hopes that the government would come up with suitable incentives to bring on-board specialised private hospitals, too. Bottlenecks notwithstanding, the Ayushman Bharat is on its way to reaching millions of Indians who were unable to exercise their basic right to inclusive medical care, despite their contribution to a growing economy. The author is a historian, political analyst and a Senior Research Fellow at the Nehru Memorial Museum and Library. This is the fifth part of a series on the author’s conversations with beneficiaries of schemes launched by the Narendra Modi government.